Wow! Gorgeous pictures! That looks like a beautiful place. Cartagena has a long and fascinating history and magnificent ruins as well as a well preserved and charming historical old town. It’s one of the most beautiful cities we’ve seen in Latin America. You two certainly discover a lot of ‘odd’ monuments. Dr. Suess is an all time favorite. It’s crazy how many of his lines can dance through my head at different times. I love the was you incorporated him into the post! Dr. Seuss is one of our favorite writers (which proves a part of you never gets old!) and we had fun using some of his lines in this post. As for odd monuments, it’s great to see the areas that are big tourist draws but it’s also cool to find some of the off-the beaten-path places. What a lovely day you had! I personally love these kinds of tours where you can relax and enjoy the scenery without trying to figure out where everything is. Your photos are wonderful too!! We had a great time watching the city go by and, you’re right, it’s kind of nice to kick back and not worry about figuring out where we’re at or how to get to where we’re going! Dr. Seuss is soooooo inspiring isn’t he?! It’s funny you should pick that particular line to quote as we included it in our “About Us” profile as our travel and life philosophy. After years of following the “normal” path of family,home and work we’re having a blast figuring out which direction(s) we want to explore. You had the best of the tours when the tour guide adds so many interesting stories. Now I’m curious as to why there would be a monument to high top shoes. I loved bouncing along with you on this trip. So glad you enjoyed joining us on our bus ride. As for the sneakers sculpture … I have no idea why this was included in the tour (maybe a photo opportunity?) although Richard really enjoyed the brownie he bought at a school bake sale nearby! 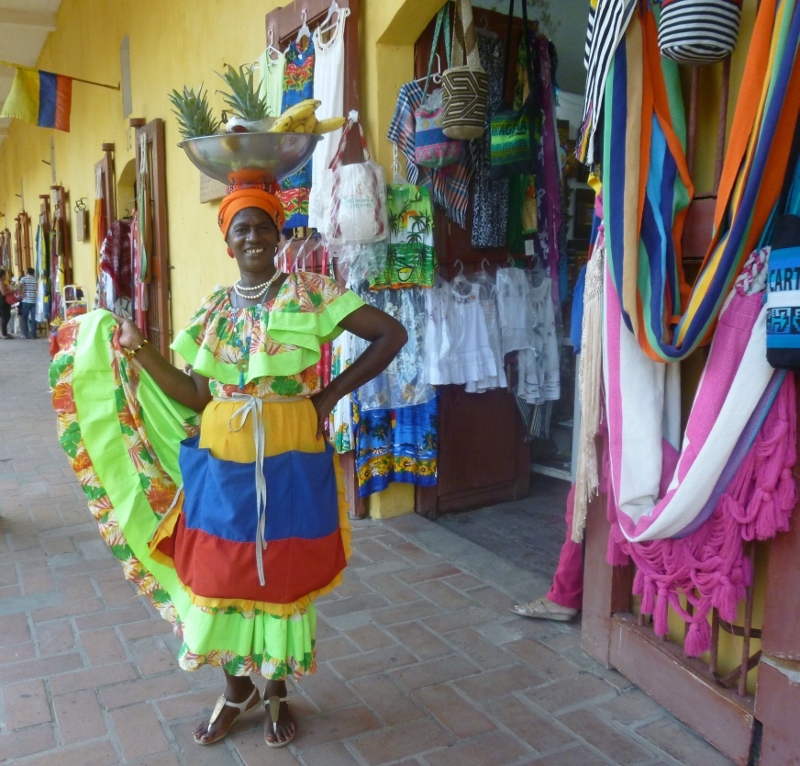 What a colorful tour of Cartagena! It’ll be the one I take when I’m there. 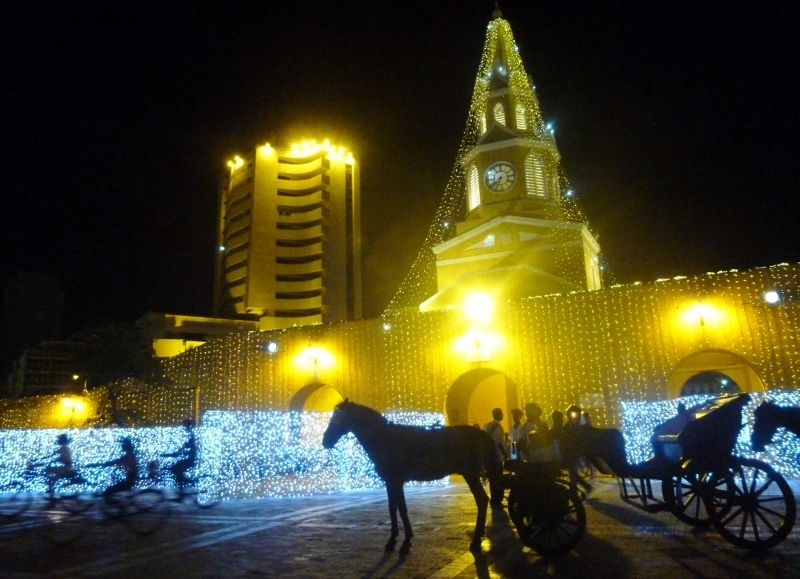 If you only have a day or two to visit Cartagena then this is the tour for you! It hits the high points and and gives a great overview of the city. And, of course, then you have to walk around the picturesque walled city, too! Thanks for taking us on this trip with you! Sounds like so much fun and filled with local color. So glad you enjoyed our post Irene. Cartagena is a vibrant and colorful city and we had a great time writing about our entertaining tour and sharing it with you. Love it! What better way to take a tour than in a rolling Sesame Street colored boom box? Can’t think of any right off hand. Sometimes a city tour can be a terrific way to acquaint yourself with a new place and this was certainly one of them. All of the high points with plenty of local color! Love the bus! We rode similar conveyances in Fiji and felt like real locals. The music adds to the fun. Loved your description of the hordes of cruisers disembarking, too! Good times. Riding the bus around the city was a lot of fun and the music was a hoot! Since we’ve been in Cartagena during the high season the enormous groups of tours have been hard to avoid and sometimes, difficult to navigate around! What a fun post! It sounds as though you saw a lot on your bus tour. A hill where locals worshipped a deity that resembled a goat is unique enough on its own! Thanks Michele. The bus tour was quite comprehensive and a great value. 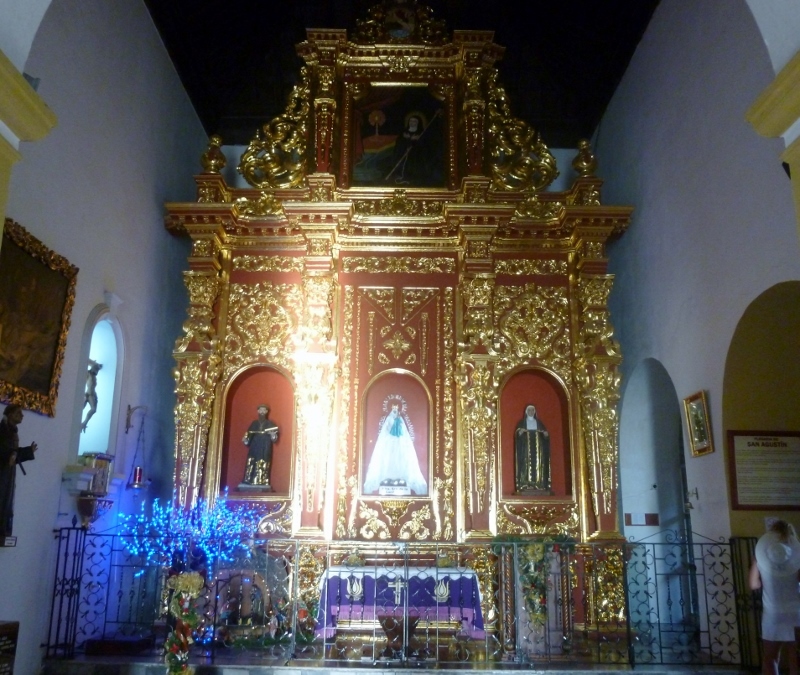 It’s always fun to learn about some of the local legends and the story of the deity, Buziriaco, caught our attention as well as our imaginations! We can see why you’d like a return visit to Cartagena. It’s one of the prettiest cities we’ve been to in Latin America with its colorful colonial architecture and the statues and sculptures set in the parks and public plazas. Love it! Cartagena looks like a fun city to explore :-). This city tour might be good for cruise ship passengers who have a day in port ?? Cruise ships dock here regularly and this is a city that would be at the top of my list to see if I were a passenger. 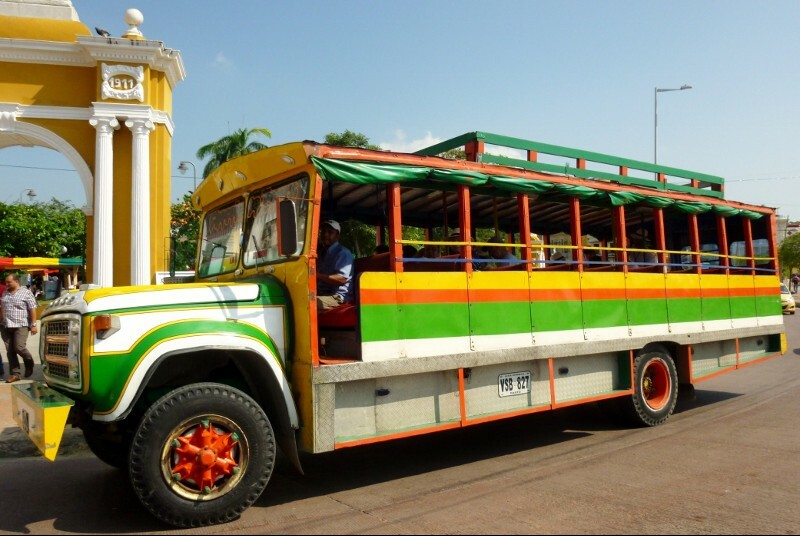 The city tour bus would be a fun adventure for a group and and a good chance to experience some of the high points of the city. Sounds and looks like a wonderful tour. I love the bus. The Places You’ll Go is a favourite book of mine too. We usually try to avoid big tours if we’re going to be in a place for any length of time but who could resist the bus?! Seriously, it was a terrific way to get a feel for the city and the price was reasonable. What a fun tour, I enjoyed seeing all the highlights. I’m sure the views from above must have been stunning to the city and area below. 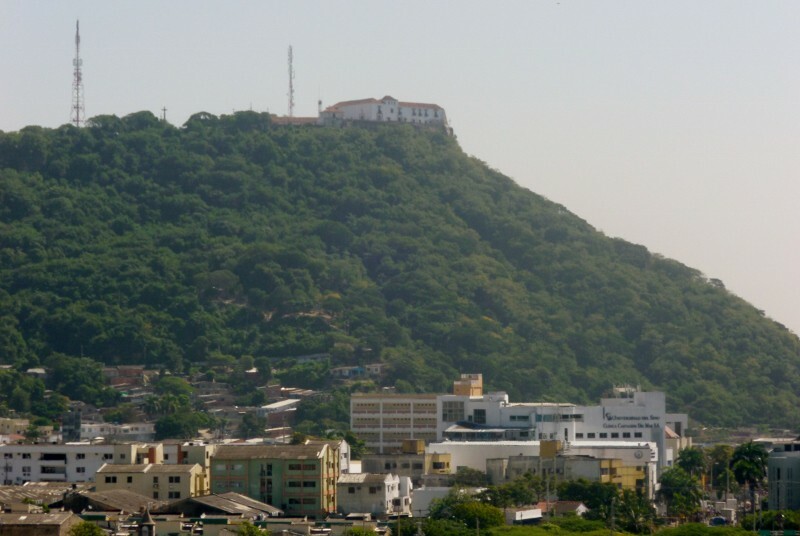 It’s always helpful to see a city from above and the panoramic view from the Hill of La Popa was interesting with the fabulous historic old city, the modern skyscrapers of Bocagrande and the urban sprawl. Except for a slight haze it was a great way to see how the city was laid out. My hero Dr. Seuss interspersed with your adventures. What could be better? Thanks once again for taking us along! Dr. Seuss only gets wiser as we get older. The blog was a pleasure to write and we’re glad you enjoyed the ride! A rolling Sesame Street colored boom box…disgorged passengers following their leader like a flock of demented goslings…oh Dr. Seuss would love your descriptions. Thanks for the great tour and the chuckles. I really enjoy your sense of raucous humor. So glad you liked this post and that you it made you chuckle! Sometimes we try to top each other with our descriptions! The tour was a fun way to get an overview of the city and then decide what we might want to spend more time revisiting later. And the good music was a bonus! 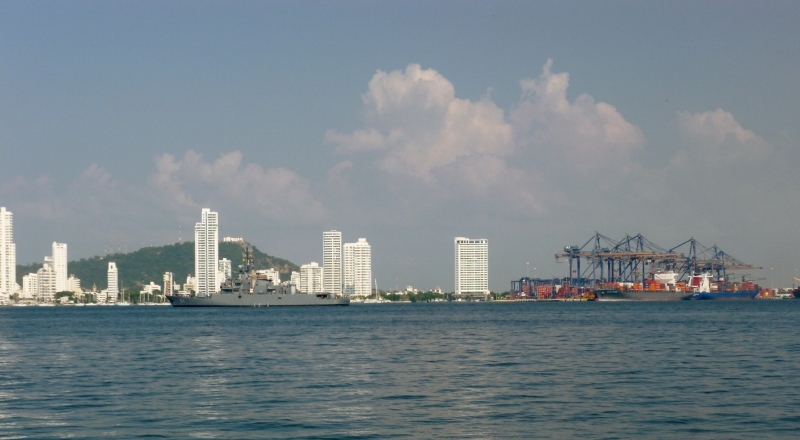 Cartagena is yet another place you’re visiting that is on our list when we hit the road again! I can’t wait to hear more about your stay there. Our list keeps getting longer as we read blogs and research cities and countries and I imagine the same is true for you. We have a few more posts on Cartagena scheduled (stay tuned!) and then we’ll also be hitting the road again. Enjoyed your blog and I remember that shopping area (previous prison) from our trip there. How fun seeing something I remember. Looks like a fun time. Be safe and enjoy the travels. We passed our halfway point in Gorgona and time is flying by. Thanks for the Cartagena memories!! !